Teaching your dog how to hold objects can be not only part of a fun game, but also a useful command in general. 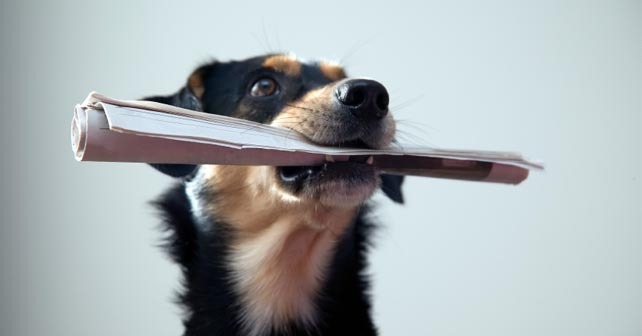 When teaching your dog to hold something, all the reward must be praise based, as offering food treats will cause the dog to drop the object and hinder training. Get your dog to Sit and lower yourself to the dogs level. Gently pet your dog whilst slowly opening the dogs jaw with your thumb, praising him when he lets you. Try not to be overly forceful as most dogs will not want you to poke at their mouths, gums or teeth. Place an object such as a ‘Fetch Dummy’ or rolled piece of carpet into the dogs mouth and praise with ‘Hold’ or ‘Good Hold’. Continue the praise until the dog drops the object. Repeat the process again using the verbal command ‘Hold’. Eventually, simply bringing the object to his nose should lead him to open his mouth and take the object. Offer heavy praise when he does so. When the above steps have been completed. Bring the object to the dog’s nose and slowly lower it to the floor. Keep a hand on the object and give the verbal command. As the dog approaches and picks it up, take your hand away and praise the dog ensuring he does not drop the object. Once you and your dog have mastered the command, games such as ‘Fetch’ can be played with more obedience.